With a 5 year old in my house, we have been through our share or juice, that's for sure. Avery started on juice at just 9 months old. and we ALWAYS went with Juicy Juice. It was always our juice of choice as they had the most flavor options and always offered a lower sugar product, which we opted for. This time I received some of their new Fruitifuls products for review. I got 4 flavors to try! The best part about these is they have 35% less sugar than leading juices. The average 4-8 year olds consume 21 teaspoons of sugar daily!! ICK!!! That is a ton of sugar. Thankfully I'm always aware of what my kids are putting in their bodies, but sometimes it's hard when you're giving them a juice box that you think is 'healthy' for them. The average juice box has about 24g of sugar in them. These Juicy Juice Fruitifuls have just 13g!! Every person in the family tried these juice boxes and I think we each liked the Orange Strawbana Blast the best. This flavor was really yummy in the morning with breakfast. Emerson likes them all though. He's just now getting into juice as he wouldn't use a sippy cup before now and I would never give him juice in his bottle. He's liking them all (diluted of course). Avery likes them all as well. These are wonderful since she takes 1 juice box a day to school. These are perfect for her lunch box and I know that they're healthier for her and I'm not worried about the sugar she consumes while she's at school. 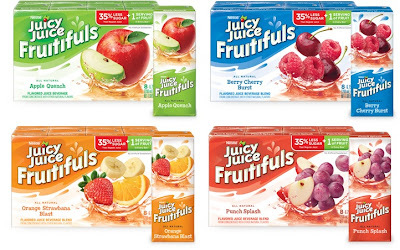 These juice boxes offer a FULL SERVING OF FRUIT per box!!!! How awesome is that! They have all natural ingredients as well. 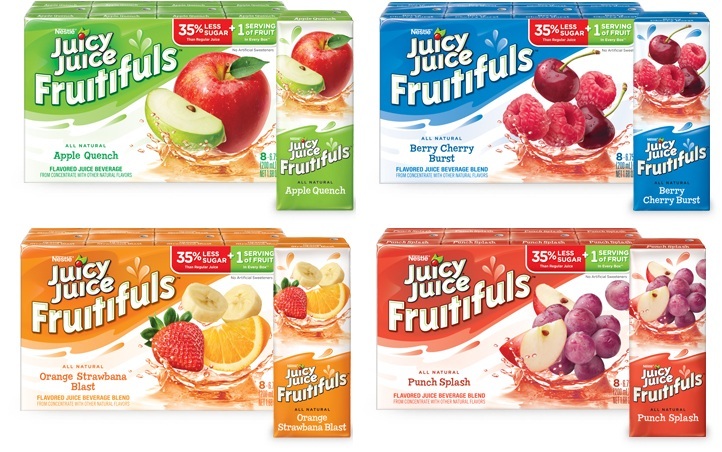 Price: These vary depending on your store, but they are the same price as the regular Juicy Juice boxes in my stores! Overall: ***** love these boxes and love that they have less sugar! I want to try the apple quench. I think my son would go nuts for the Orange Strawbana Blast. Thanks for the giveaway! I'd try the Punch Splash! I would love to try the Berry Cherry Burst with my kiddos. My daughter loves berry anything! i would try Berry Cherry Burst first!!! Yum! My daughter would like the Orange Strawbana Blast. apple Quench! Sounds so refreshing! Punch Splash or Berry Cherry Burst would be my top choices. I would try the Berry Cherry Burst first. I want to try Punch Splash. I'd love to try the Orange Strawbana Blast. Berry Cherry Burst sounds good. I'd try the Punch Splash. I think I'd go with Berry Cherry Burst! I like the orange strawbanana blast. Thanks for hosting! I'd like to try white grape! Berry Cherry Burst sounds great! My son like the cherry and he's 24! Personally I'd like to try the orange-tangerine. My kids would love the Orange Strawbana Blast! Orange Strawbana Blast is my Juicy Juice of choice! Orange banana blast looks good! Apple Quench for my daughter. I'd try white grape first. Grape is my favorite.